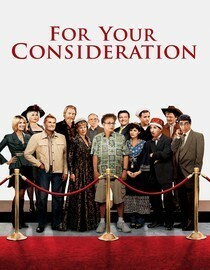 Featuring: Catherine O'Hara, Eugene Levy, Harry Shearer, Christopher Guest, Ricky Gervais, Jane Lynch, Michael McKean. Director: Christopher Guest. Warning: This movie is only supposed to be available for streaming until Jan. 1st. Act fast! I'm not one to throw out the term "mildly amusing" lightly, but mildly amusing is exactly what you get with this movie. I kept expecting it to become really funny but all I ever got were a few average laughs. It was disappointing because there was a plenty talented cast, I just think the writing was a little off. It had the right story for a good satire. A bunch of washed up actors make a bad movie but somehow get some Oscar buzz and Hollywood idiocy ensues. Despite a premise with promise, this Christopher Guest movie just didn't do it for me like some of his earlier movies. Instead of being a hilarious send up of the movie industry the way he mocked community theater and dog shows, you get what just sort of feels like an industry movie that would probably only be interesting or funny to people in the industry. It didn't have the appeal of a Waiting for Guffman or Best in Show. Sure, those were movies about certain industries too, but the characters were relateable even if you don't know a damn thing about dog shows. Unless you're a die hard Christopher Guest fan, I recommend skipping this one and just checking out Waiting for Guffman or Best in Show instead. According to Netflix this movie will stop streaming on 1/1/12. Of course, sometimes they lie. Why is it in your queue? I've had some laughs out of prior Christopher Guest movies so I thought I'd give this one a try too. Is it artsy? No, it's a showbiz movie. Showbiz ain't no kinda art baby. What stood out the most to you? It felt like it was going to become hysterical soon, but it never did. What mood should I be in to watch this movie? Really into the inner workings of Hollywood I suppose, or at least satires of it.